Highways England has confirmed that it will contact the transport secretary to gain specific permission to move forward with a £500m scheme that has been assessed as providing ‘poor’ or ‘low’ value for money. If a scheme falls below a benefit-cost ratio of below 1.5, Highways England chief executive Jim O’Sullivan is obliged to write to the Department for Transport to make sure the government-owned company should proceed. Having launched a consultation on two possible routes to dual the A417 ‘missing link’ at Air Balloon roundabout, despite the £500m schemes being assessed as providing ‘poor’ and ‘low’ value for money respectively, Highways England has conceded that progressing either option would require express permission from ministers. 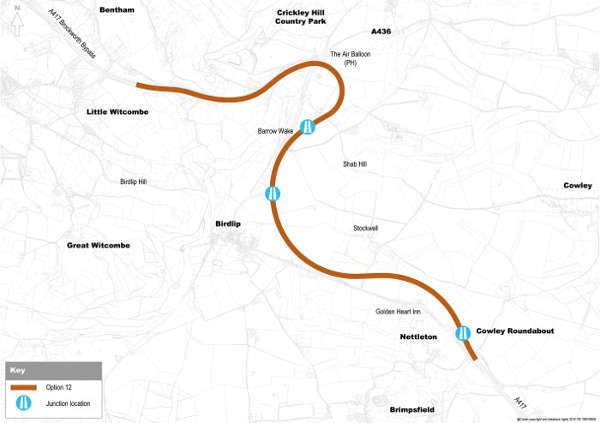 One option – Option 12 – is a four-mile surface route reusing sections of the existing A417 on Crickley Hill and Birdlip. New sections of road will be built at Nettleton and Emma’s Grove. 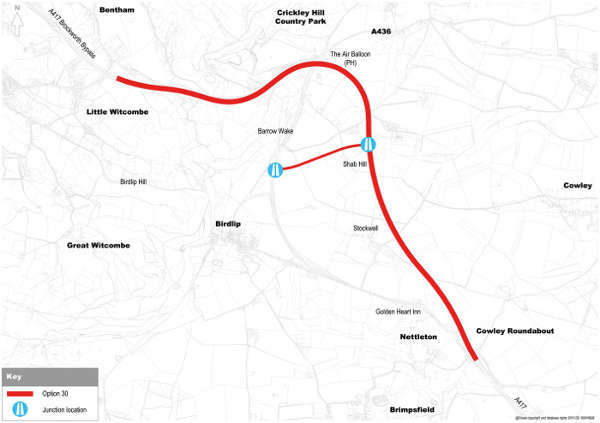 This option would include three new junctions – one at Cowley roundabout, one on the existing A417 close to the B4070 junction at Birdlip and one to the north of Barrow Wake. There would be three lanes of carriageway going up Crickley Hill and two lanes coming down. The consultation document acknowledges that while this £465m option offers poor value for money (at 68 pence per pound), ‘it falls within the [£250m-£500m] cost range for the scheme’ whereas most other options, which included tunnels, did not. The other option – Option 30 – is a 3.4-mile surface route following the alignment of the existing A417 at Crickley Hill with less of a slope. A new section of road will be built through Shab Hill to the east of the existing A417, re-joining the existing road near Cowley roundabout. It would include two new junctions – one at Shab Hill and one on the existing A417 close to Barrow Wake with a link road in between. There would be three lanes of carriageway going up Crickley Hill and two lanes coming down. A spokesperson for Highways England confirmed that, because both schemes are below a benefit cost ratio of 1.5, progressing either would require its chief executive, Jim O’Sullivan, to write to Mr Grayling, who could potentially refuse permission, but that Highways England would continue to work with the Department for Transport as plans are developed. ‘The A417 provides an essential link between the M5 at Gloucester and the M4 at Swindon – two of the region’s top growth areas – and the proposed upgrade of the three-mile section of single carriageway, known as the Missing Link, will help these areas flourish. ‘A solution for this route presents unique challenges and any upgrade needs to take into account the sensitive environment of the Cotswolds Area of Outstanding Natural Beauty. The government-owned company said the current three-mile stretch of single carriageway road between the Brockworth bypass and Cowley roundabout restricts the flow of traffic on a key route that is otherwise a continuous dual carriageway between the M5 and M4, and argues that the scheme has wide ranging economic benefits for the area. Project manager Mike Goddard said: ‘Improving this missing link will be a benefit to local residents, users of this important route, and those accessing the walking routes of the Cotswold Way and the Gloucestershire Way. Reducing unpredictable delays will encourage motorists to stay on the A417 with reduced journey times, leaving local roads less congested. Highways England added that the A417/A419 route passes through the Cotswolds Area of Outstanding Natural Beauty and that ‘any solution will be designed sensitively to meet the special character of the landscape, environment and history’. The consultation started on 15 February and closes on 29 March.